In the autumn of 2018, the European Foundation for Support of Culture together with the Kazakh National University of Arts – Kaznua will hold a festival dedicated to the 160 th anniversary of the birth of the Italian composer Giacomo Puccini in Astana, Kazakhstan. Giacomo Puccini was one of the leading composers of the verismo style in music. Some researchers call him the greatest composer of Italian opera after Verdi. At the same time his artistic world differs from the world of Verdi, since it developed in a different historical period. His first opera, Le Villi, which was a great success, was staged in 1884. The opera Manon Lescaut received even greater acclaim in 1893 in Turin. The public went into raptures over Puccini and this love and glory grew thanks to the new creations of the composer. Puccini’s music has been glorified by unanimous admiration and, even now, all operas by Puccini are included in the repertoire of opera theatres, which is very rare. 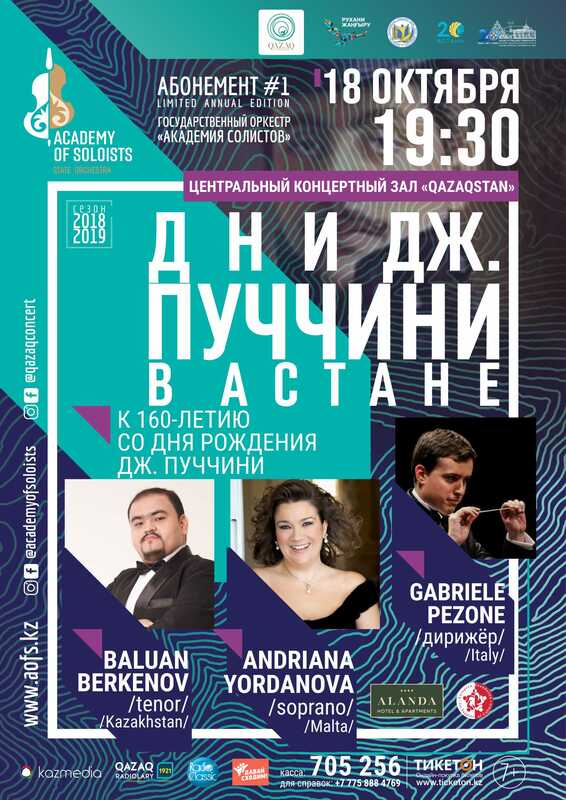 In Kazakhstan, in honour of the 160 th anniversary of Puccini’s birth, a series of anniversary concerts will be held together with master classes by professors from leading music schools of the world. On the stages of the most famous theatres of Astana, the opera masterpieces of the composer will be performed by: the winner of international competitions, opera singer Baluan Berkenov; the opera diva of the Manoel Theatre Andriana Yordanova; the Kazakh State Orchestra “Academy of Soloists” under the direction of the famous Italian conductor Gabriele Pezone. During master classes, young talented singers will sing compositions of Giacomo Puccini and famous Maltese composes.